"... a right which one landowner has with respect to the lands of another - either the right to do something on the other's land, or the right to prevent the other owner from using their land in a particular way." "... a privilege or advantage, which one man may have in the lands of another...."
"When A, the owner of a piece of land, has the right of compelling B, the owner of an adjoining piece of land, either to refrain form doing something on his (B's) land, or to allow A to do something on his (B's) land, then A is said to have an easement over B's land." Although right-of-ways are the most common easements, there are many others such as rights to tunnel under another’s land, to use a washroom, to emit smoke or fumes, to pass over with transmission towers, to walk on a path or trail, to access a dock and to access a well. "In respect of water, air, light, rights of way, rights of support, party-walls and fences and easements of recreation...."
"(1) That it applies to land which is affected by it (the servient tenement); (2) that it is annexed to other land which takes the benefit of it (the dominant tenement); and (3) that it is a right of a kind which, as a matter of common sense and public policy, is capable of forming the subject-matter of an easement." An easement is a type of servitude and is one of the rare common law concepts which is taken extensively from Roman law and civil law. For every easement, there is a dominant and a servient tenement. Easements are also classified as negative (which prevents the servient land owner from doing certain things) or affirmative easements (the most common, which allows the beneficiary of the easement to do certain things, such as a right-of-way). "I, John Doe, very wealthy and eccentric person, of the City of Victoria, British Columbia, owner of 1234 Park Place Avenue, New York, New York, in consideration of a perpetual mention on the Duhaime.org website under the Law Dictionary title of easement, agree to grant to Duhaime.org, its successors and assigns, an easement and right to enter on my land as defined above for the purpose of erecting bill boards extolling the virtues of the aforementioned website, and Duhaime.org or its officers or agents shall have access to the land at any time subject to the restoration of the land to its former state after construction is complete." Bouvier, John, Bouvier's Law Dictionary (Boston: The Boston Book Company, 1856). Buckland, W. and McNair, A., Roman Law and Common Law (Cambridge: University Press, 1965), page 61. Byrne, W., A Dictionary of English Law (London: Sweet & Maxwell, 1923), p. 330. La Forest, A., Law of Real Property (Ontario: Canada Law Book, 2006), p. 17-2. 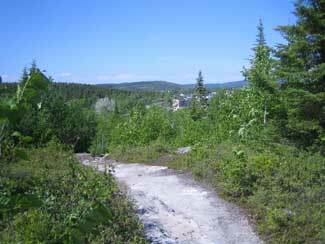 Image is of a part of the Pierre Ouellette Trail, through the woods near Baie-Comeau, Quebec, taken in June of 2009, providing access between the ballpark and the beach trail. Sara, C., Boundaries and Easements (London: Sweet & Maxwell, 2002).